Fort Blakeley, named for the town which it surrounded, was one of two major Confederate defensive positions protecting eastern approaches to Mobile during the Civil War. The fort consisted of a nearly three mile long series of entrenchments anchored by nine earthen redoubts, or reinforced independent positions. Within this line of defenses were a series of trenches, artillery emplacements, and assorted other earthen defensive structures. A series of rifle pits, in which teams of skirmishers could be deployed, lay a short distance in front of the main line. 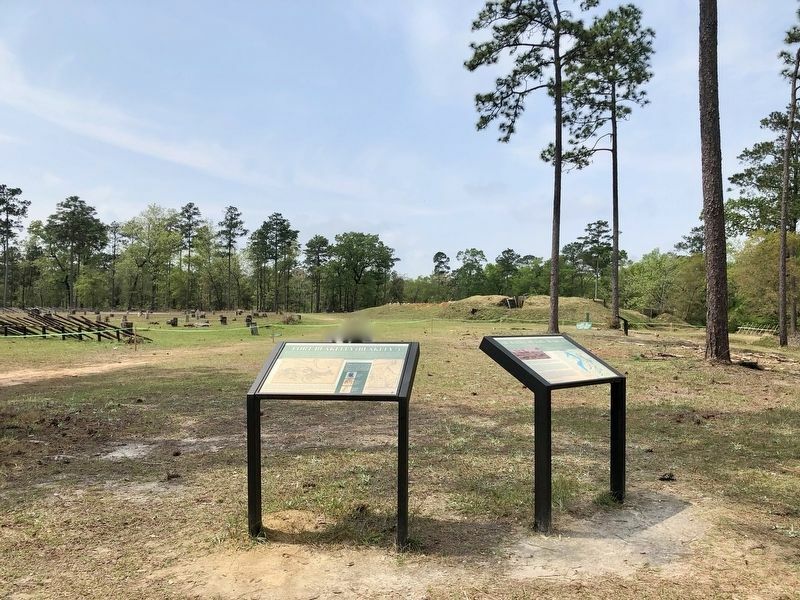 Confederate troops and impressed African-American laborers had been engaged in the construction of Fort Blakeley for many months prior to the battle here in April of 1865. These men had cleared fields of fire in front of the main line up to a distance of about 800 yards. They had also built two lines of obstructions using tangles of fallen trees, and even had strung telegraph wire between stumps as barriers to approach. To further slow potential attackers, in places defenders had buried dozens of land mines, commonly referred to at the time as "torpedoes. 2. Fort Blakeley Marker with Redoubt #4 in background. 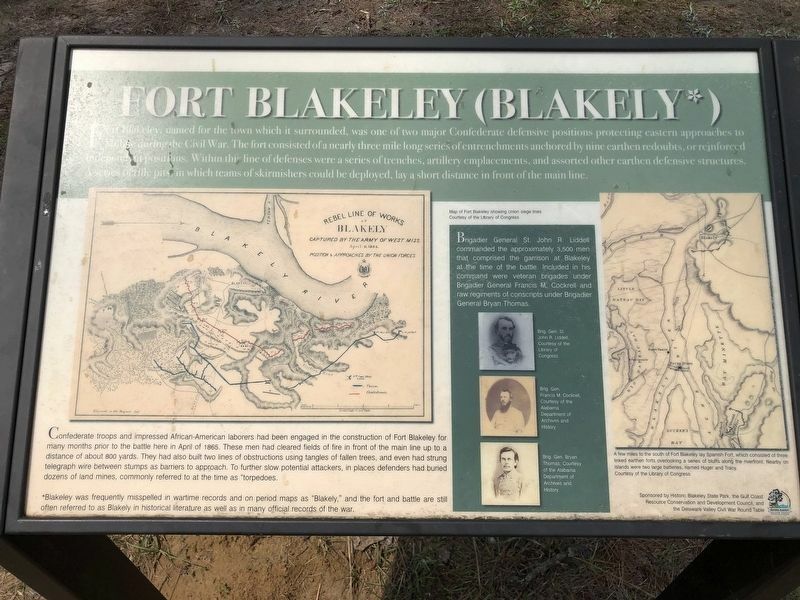 misspelled in wartime records and on period maps as "Blakely," and the fort and battle are still often referred to as Blakely in historical literature as well as in many official records of the war. Brigadier General St. John R. Liddell commanded the approximately 3,500 men that comprised the garrison at Blakeley at the time of the battle. Included in his command were veteran brigades under Brigadier General Francis M. Cockrell and raw regiments of conscripts under Brigadier General Bryan Thomas. Map on right: A few miles to the south of Fort Blakeley lay Spanish Fort, which consisted of three linked earthen forts overlooking a series of bluffs along the riverfront. Nearby on islands were two large batteries, named Huger and Tracy. Erected 2017 by Historic Blakeley State Park, Auburn University College of Liberal Arts, the University of Alabama Center for Economic Development, and the Delaware Valley Civil War Roundtable. 3. Mounted 16th CS Cavalry completes changing of the guard at Redoubt #4. 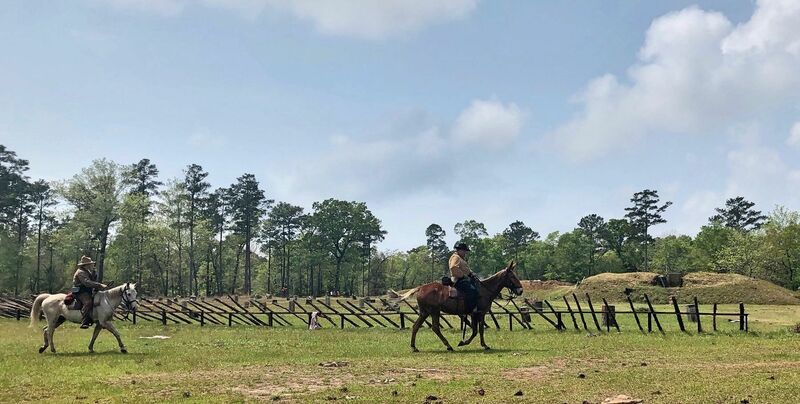 Attended the April 2019 reenactment of the Battle of Fort Blakeley. County. Marker can be reached from Battlefield Road 0.3 miles east of Green Street, on the right when traveling east. Touch for map. Located in Historic Blakeley Park at Redoubt #4. Marker is at or near this postal address: Battlefield Road, Spanish Fort AL 36527, United States of America. Touch for directions. Other nearby markers. At least 8 other markers are within walking distance of this marker. The Battle of Fort Blakeley (here, next to this marker); The United States Colored Troops (USCT) at the Battle of Fort Blakeley (about 600 feet away, measured in a direct line); The Siege of Fort Blakeley (about 600 feet away); The Battle of Fort Blakely (approx. 0.3 miles away); Alabama (approx. half a mile away); Battle of Blakeley (approx. half a mile away); Redoubt Six (approx. half a mile away); The Bottle Creek Site (approx. ¾ mile away). Touch for a list and map of all markers in Blakeley. More. Search the internet for Fort Blakeley (Fort Blakely*). Credits. This page was last revised on April 9, 2019. This page originally submitted on April 8, 2019, by Mark Hilton of Montgomery, Alabama. This page has been viewed 41 times since then. Photos: 1, 2, 3. submitted on April 8, 2019, by Mark Hilton of Montgomery, Alabama.